Stephanie and I began thinking about the topic for our next anthology as soon as we finished gathering submissions for My Other Ex. We had a lot of ideas, but nothing felt like a topic that we urgently wanted to tackle. That is, until one of our contributors, Alexandra Rosas, describing her experience with Postpartum Progress and its Climb Out of the Darkness event, suggested postpartum depression. She had been inspired by the stories of the survivors that she met and thought that so many women could benefit from hearing them. As someone who went through my own postpartum struggles, I was immediately drawn to this idea, as was Stephanie. Today we’re thrilled to tell you about our next anthology, a call for submissions, and our first writing contest, in partnership and in support of Postpartum Progress. Approximately 1 in 7 women suffer from postpartum depression after having a baby. Many more may experience depression during pregnancy, postpartum anxiety, OCD, and other mood disorders. Postpartum depression is in fact the most common pregnancy-related complication, more widespread than gestational diabetes, preterm labor, or pre-eclampsia. Yet confusion and misinformation about postpartum depression and anxiety — from their symptoms to timelines to prevalence to treatment — are still widespread. Myths surrounding mothers’ mental health challenges can have devastating effects on women’s well-being as well as their identities as mothers, too often leading to shame and inadequate treatment. Although postpartum and antepartum depression and anxiety are temporary when treated, untreated mood disorders can lead to long-term consequences for both a mother and her child. A mother can feel very alone, ashamed, and hopeless. And keep silent. Mothering Through the Darkness: Stories of Postpartum Struggles will be a unique anthology with the goal of breaking that silence. With this collection of essays, we will try to dispel these myths and focus on the diversity of women’s experiences, through the voices of mothers themselves. We are also thrilled to be partnering with Katherine Stone and Postpartum Progress on this project. Postpartum Progress is a national 501c3 nonprofit organization that is laser-focused on maternal mental health. The organization has three key focus areas: raising awareness, fighting stigma and providing peer support for pregnant and new mothers. Postpartum Progress’ award-winning blog is the most widely read blog in the world on perinatal mood and anxiety disorders, with more than 1.1 million page views each year. 10% of the profits from the sales of this book will go toward Postpartum Progress and its mission of supporting maternal mental health. Click here to find out more about Postpartum Progress’s work in raising awareness and supporting mothers. * One of the first questions that we got in talking to women that we knew about this project is whether a woman needs to have been formally diagnosed by a medical professional with postpartum depression or another postpartum mood disorder to submit. The answer is no! Postpartum mood disorders are vastly under-identified and under-treated. Many, many new mothers have symptoms that are not fully addressed or explained. The symptoms of postpartum depression include: loss of appetite, insomnia, intense irritability and anger, fatigue, loss of joy, mood swings, feelings of guilt and shame. Read more from Postpartum Progress about what PPD feels like, in understandable terms, and see if any of these symptoms matched your own experience. 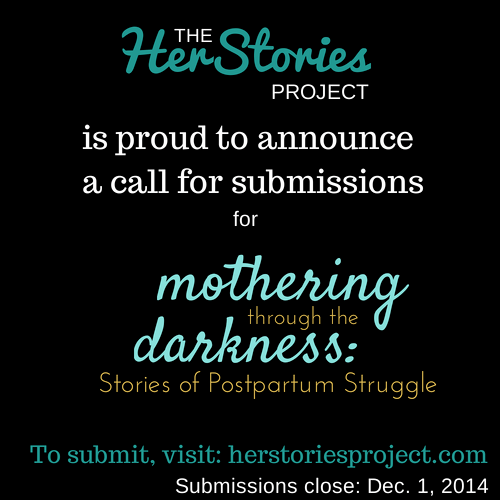 Your submission to Mothering Through the Darkness will be simultaneously entered into the first HerStories Project Writing Contest. (see details below) The HerStories Project will award $500 to one submission for Best Essay and $100 to two runners-up. All three essays will be published in the book, and each winner will receive a paperback copy. To cover the costs of sponsoring the contest, we are asking for a $10 reading fee. If this fee presents a financial hardship that would otherwise prevent you from submitting an essay, we will waive this fee and this will not affect the status of your entry. To submit, see the link at the bottom of this page. 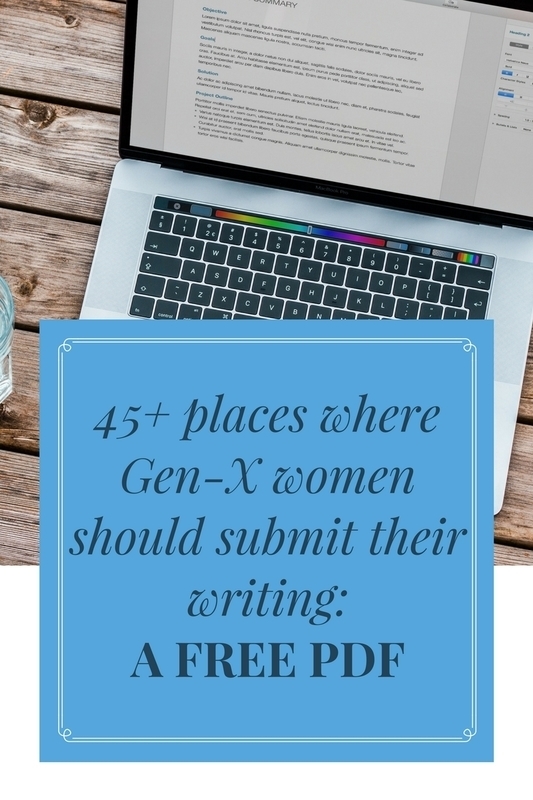 Judges: The essays will be judged by the editors of the HerStories Project, as well as several talented writers whose lives as mothers or as clinicians have been affected by postpartum depression and anxiety. These judges will include Lisa Belkin, Kate Hopper, Katrina Alcorn, Julia Fierro, Dr. Jessica Zucker, and Lindsey Mead. Essays will be judged on their emotional power, originality, and quality of their prose. Katrina Alcorn is the author of Maxed Out: American Moms on the Brink . She is a writer and a design consultant. She holds a master’s degree in journalism and documentary filmmaking from UC Berkeley and blogs at WorkingMomsBreak.com. Lisa Belkin is the Senior National Correspondent for Yahoo News. Previously she has held staff positions at the New York Times and The Huffington Post. She is the author of three books and the editor of two anthologies. Julia Fierro is the founder of The Sackett Street Writers’ Workshop. A graduate of the Iowa Writers’ Workshop, she recently published her first novel, Cutting Teeth, an Oprah Pick of the Week. Kate Hopper is the author of Ready for Air: A Journey through Premature Motherhood and Use Your Words: A Writing Guide for Mothers . Kate holds an MFA in creative writing from the University of Minnesota and has been the recipient of a Fulbright Scholarship, a Minnesota State Arts Board Grant, and a Sustainable Arts Grant. She teaches classes and holds retreats for mother writers. Lindsey Mead is a corporate headhunter with an MBA from Harvard who also writes for her popular blog, A Design So Vast. Her work has been featured in numerous anthologies. Jessica Zucker, PhD is a psychologist specializing in women’s reproductive and maternal mental health. A consultant to PBS’ This Emotional Life and the Every Mother Counts campaign with Christy Turlington, she has been a contributor to NPR and is currently writing her first book for Routledge on maternal attachment. If you are entering the HerStories Project Writing Contest, please click here to pay the $10 reading fee. If you would like the fee to be waived, please mention this in your submission. Question: I have a couple friends who might be interested, but they were confused because this post is dated Jan. 9th, but the contest description says that it’s deadline (after extension) was the first. Has there been another extension?